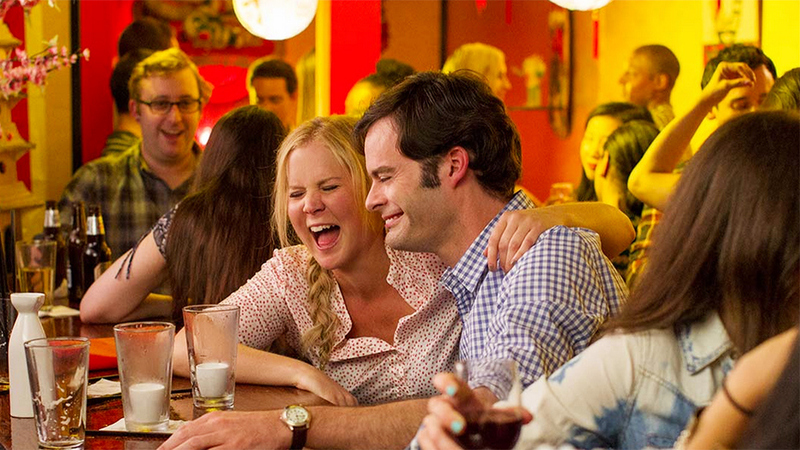 The latest release from the Judd Apatow empire opens tomorrow here in Seattle, written by and starring comedian Amy Schumer and directed by Apatow himself. Schumer plays a magazine writer with commitment issues and a fondness for wine and weed. Much to her surprise, she falls for a dweeby sports surgeon (Bill Hader) and must choose between growing up and reforming her ways or losing a swell guy. The film thus deftly flips the gender roles of a typical Hollywood romantic comedy, as it’s been practiced in film and television of the past 30 years or so. That reversal is the motor of the funniest parts of the film: Schumer’s assertiveness with her boyfriends (an agonizing attempt at dirty talk from John Cena) and Hader’s heartfelt exchanges with his athlete friends (LeBron James and Amar’e Stoudemire). Filled with the surreal-improv style comedy from the supporting players that defines the Apatow brand (it’s no surprise that the clear winner this time is Tilda Swinton), the film is dragged down by the shambolic, disjunctive approach to narrative that has also come to define Apatow’s work.